No. 7/8 Quinnipiac returns home to the friendly confines of the High Point Solutions Arena this weekend for the team's ECAC home opener. They kick things off with the Dartmouth Big Green who are off to a surprising 2-0-1 start to begin the season. Bob Gaudet's team welcomes eleven freshman to a program coming off a surprise ECAC semi-final appearance in Lake Placid a season ago where they fell to Quinnipiac. Already, the Big Green has an impressive home win against the Michigan Wolverines along with a win over Colgate and a tie with Cornell. Now comes a stretch of seven games away from Hanover, NH starting with the Bobcats on Friday night. Offensively, Dartmouth does not bring a lot of size or elite talent up front. Gaudet does a good job getting the most of the talent he has to work with and that has led to some success for him at Dartmouth, yet he is still seeking his first NCAA tournament appearance at his alma mater (he took Brown to the NCAA's in 1993). 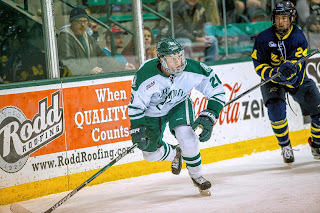 So far, its a lot of the upperclassmen doing the damage for Dartmouth with junior Carl Hesler (1 goal and 2 assists), senior Troy Crema (2 goals) and junior Corey Kalk (1 goal and 1 assist). Crema two goals both have been game winning goals which is 2nd in the nation. Freshman Cam Strong has a goal and and assist while three other freshman have also recorded assists. Senior Grant Opperman has 56 points in 99 career games. Seven underclassmen have started at least two games up front so they are definitely an inexperienced team on offense. They average two goals per game and have a power play that is only scoring at 6.25% clip (2-of-32). 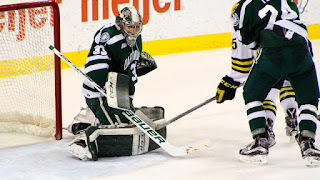 To beat Quinnipiac on the road, the Big Green will surely need to score more than two goals. The Bobcats should be able to be physical with these forwards and eliminating defensive zone turnovers would be a good way to not have any odd rush chances in which Dartmouth could capitalize on. Defensively, the Big Green are off to a fantastic start as they lead the nation in team defense at one goal per game. They haven't brought any offense from their defense yet but so far that has not been needed. This is a pretty young defense with five underclassmen (2 freshman and 3 sophomores) on the roster. Four of those five have seen game action this year. Josh Hartley is the lone senior of the group with juniors Tim Shoup and River Rymsha the other two upperclassmen. The defense brings solid size and has played very well in front of goaltender Devin Buffalo. 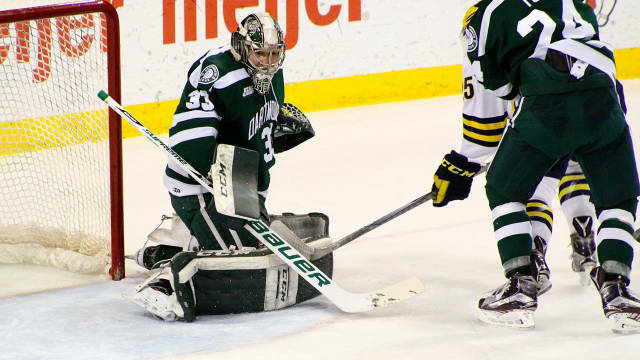 Dartmouth has also killed off penalties at an 85.7% clip (18-of-21) which is good for 23rd in the nation. Junior goaltender Devin Buffalo is off to an excellent start. In three games played he is 2-0-1 with a 0.97 goals against average and a .957 saver percentage and one shutout on the season. The defense along with Buffalo have done a good job of not allowing a lot of shots this season. They are giving up an average of 23 shots per game on the season. They have also blocked a total of 38 shots. Those numbers show that the Dartmouth defense is not giving much space to the opposition and that Buffalo is making sure he is doing his job in net. Quinnipiac is going to have be the one that is the hunter in this game. They need to win face-offs, win battles for loose pucks and find ways to score off the power play and get greasy goals on Buffalo. The Bobcats have the talent offensively to win this game, they just need some of these players to step up and produce more offensively. Defensively they need to play a sound, physical game and avoid turning over the puck in their own zone. It's been almost 10 years since the Bobcats have lost at home to Dartmouth when they dropped a 5-4 game on February 9, 2007.